As you may recall from Raiders of the Lost Ark, Jock Lindsey was Indy’s personal pilot who got him out of a jam when he was being chased by some angry natives led by his arch nemesis, Dr. René Belloq. Indy was surprised to find Jock’s pet snake, Reggie, in his seat…apparently, snakes make the best co-pilots! 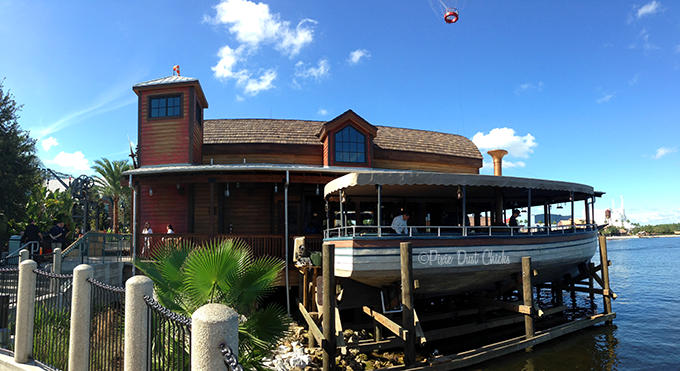 The outside of the bar resembles an actual airplane hangar, with a deck wrapping most of the way around the back and one side, offering great views of the lake and nearby Boathouse restaurant. On the side, part of the deck is a boat in dry-dock, which offers additional seating. Of course, the boat’s name, “Reggie”, is another homage to Jock’s favorite slithering friend. 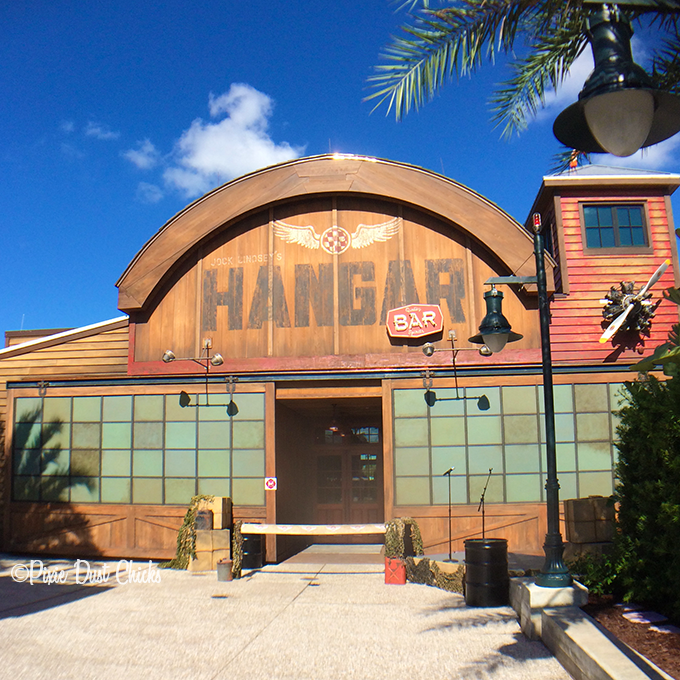 Inside, the Hangar Bar is chock full of Jock’s and Indy’s memorabilia from the movies! On our recent visit, we found the voodoo dolls (from The Temple of Doom), the medallion and the gold idol (Raiders of the Lost Ark). But keep on the look out for a few other surprises and nods, such as items from The Adventurer’s Club (in the former Pleasure Island), Star Wars, and even from the parks here at Walt Disney World. There were so much to see that we’ll be returning again and again! As for the food, it was spectacular!! We had the Tanis Tacos and the Good Dates. The tacos were amazing with falafel, shredded lettuce, and cucumber salad on top. The dates were stuffed with sweet goat cheese and had Marcona almonds on the side…and were fantastic! 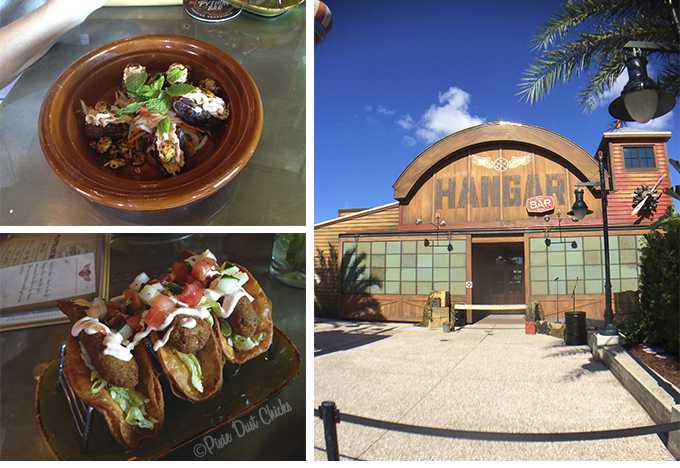 We loved both and can’t wait to have these again, along with trying other items from the menu!! 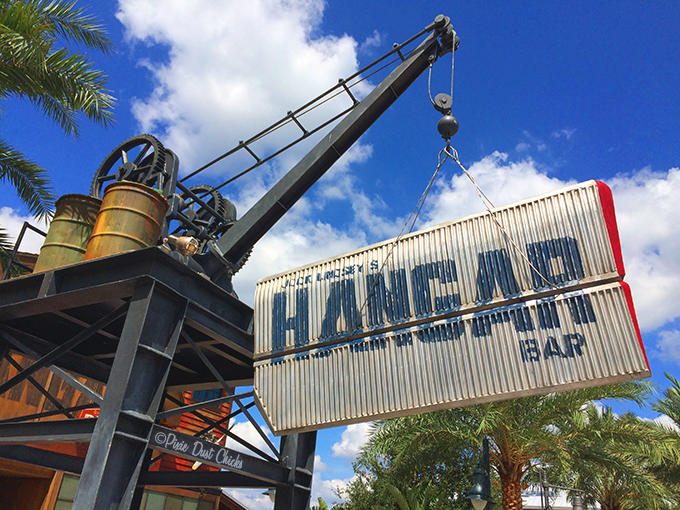 Overall, we loved our visit and can’t wait to return to Jock Lindsey’s Hangar Bar! « Frappucinos & Bows: Fall Surprises!